Robert Lambert top scored for Panthers in Plymouth. Peterborough Panthers promoter Ged Rathbone reckons a catalogue of controversial refereeing calls cost his team a place in the quarter-finals of the Premier League KO Cup last night (June 18). 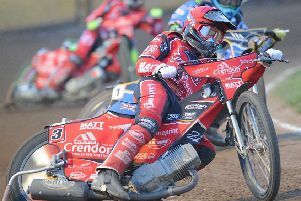 The city side fell at the first hurdle after suffering a 91-87 aggregate loss at the hands of Plymouth – the second successive season in which the Devils have dumped them out of this competition. Panthers travelled to Devon in possession of a two-point lead after a 46-44 success in the first leg at the East of England Showground last month, but they couldn’t manage a third victory of the season at the St Boniface Arena when succumbing 47-41 in the second leg to bow out. It proved to be a stormy exit with Rathbone left fuming by a series of hotly-disputed decisions from official Margaret Vardy. The first major talking point arrived in the opening race when Robert Lambert was thrown out after home rider Jack Holder had hit the deck. Rathbone was adamant his man did no wrong with the young Australian turning his machine into Lambert. Vardy was back in the spotlight in heat 11 when Lewis Blackbird was dumped on the deck by rival Ryan Fisher who then, seconds later, crashed himself. Yet when the red lights came on only Blackbird was excluded before captain Ulrich Ostergaard tumbled out of the re-run when leading. That left the way clear for Plymouth to bag a second 5-0 scoreline of the night. The previous one had arrived in heat four where Ostergaard was given his marching orders for falling in the initial staging and guest reserve Ashley Morris suffered an engine failure towards the end of a third lap of the re-run. Morris didn’t have the awareness to push his bike around to collect a point. Then, in a crucial finale, the chosen Panthers pair of Ostergaard and top-scorer Lambert rocketed from the tapes to hold the 5-1 they needed to force a run-off. The race was halted as home skipper Kyle Newman hit the deck and to the surprise of both camps, Vardy ruled all four riders could restart even though the incident was a carbon copy of one in heat four when Ostergaard was excluded. And salt was rubbed into Panthers’ wounds when Newman made the most of his unexpected reprieve to win the re-run and seal Plymouth’s passage into the last eight. Rathbone blasted: “We fought so hard and dug so deep to get ourselves back into the tie after falling behind early on, but those decisions cost us the meeting. End of story. “We did not get a single decision go our way all night and it is so frustrating to go out of the KO Cup in this manner. Panthers found themselves seven points adrift on the night early on, but they battled back superbly. Back-to-back 5-1s inspired by Michael Palm Toft and Blackbird were followed by an Ostergaard triumph in a heat nine 4-2 to turn their deficit into a three-point advantage in the space of just three races. The second 5-0 outcome in heat 11 put Plymouth back on top on the night and a 5-1 over Ostergaard in heat 13 moved them into ascendancy on aggregate as well. And, with the final two races ending in deadlock, that is the way it stayed. The lack of a guest number one also cost Panthers dear with four programmed rides yielding just one point. Bad luck (earmarked guest Ben Barker was hurt in a bad crash during the British Final on Monday) clearly played a part in their demise along with bad decisions. Panthers return to action when travelling to Rye House for a Premier League clash tomorrow (June 20, 7pm). PLYMOUTH: Kyle Newman 12+2, Ryan Fisher 10, Morten Risager 9, Jack Holder 6+1, Sam Simota 4+1, Todd Kurtz 4+1, Roland Benko 2+1. PANTHERS: Robert Lambert 11+2, Ulrich Ostergaard 8, Lewis Blackbird 7, Michael Palm Toft 6+1, Oliver Greenwood 5, Ashley Morris (guest) 4+2, Rider replacement for Olly Allen.